Top FBI official Andrew McCabe has been "removed" from his post as deputy director, Fox News is told, leaving the bureau after months of conflict-of-interest complaints from Republicans including President Trump. A source confirmed to Fox News that McCabe is taking “terminal leave” – effectively taking vacation until he reaches his planned retirement in a matter of weeks. As such, he will not be reporting to work at the FBI anymore. The move was first reported by NBC News. McCabe has long been a controversial figure at the bureau. Republicans have questioned McCabe’s ties to the Democratic Party, considering his wife ran as a Democrat for a Virginia Senate seat in 2015 and got financial help from a group tied to Clinton family ally Terry McAuliffe. McCabe's name has surfaced in connection with several other controversies. The Daily Beast reported that a GOP memo alleging government surveillance abuse named McCabe, along with Deputy Attorney General Rod Rosenstein and ex-FBI boss James Comey. Incidentally, the McCabe removal comes after Wray viewed the memo Sunday on Capitol Hill, as reported by Fox News’ Catherine Herridge. The removal also comes ahead of a DOJ inspector general report regarding the handling of the Hillary Clinton email probe. Several Republicans also want to know what McCabe knew about anti-Trump text messages between two bureau officials, including one that seemed to reference an “insurance policy” against Trump winning the 2016 election. 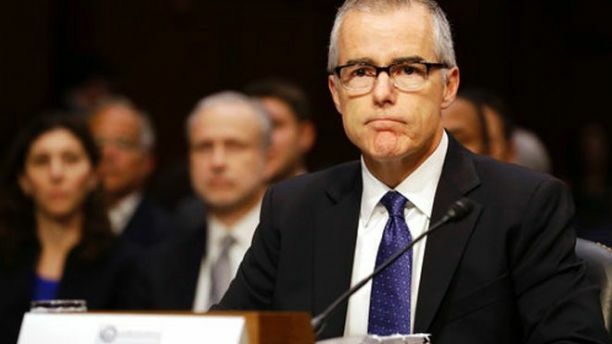 Some lawmakers think "Andy" was a reference to McCabe.